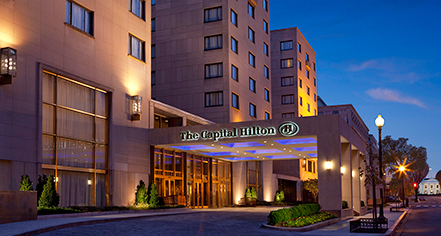 The Capital Hilton hotel's elegantly appointed accommodations feature modern amenities coupled with historical décor. With fresh local fare at the property’s onsite dining outlets, North Gate Grill, and The Statler Lounge, guests can unwind in a congenial atmosphere amid their sightseeing. The on-site fitness center offers an extensive array of state-of-the-art cardio equipment and plyometric training boxes, a studio room, weights and kettlebells. The center is complimentary for all hotel guests. 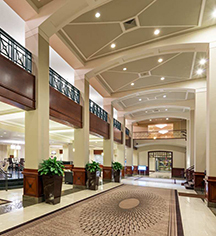 The Capital Hilton’s regal design and exquisite features have welcomed presidents, dignitaries, and countless notable leaders alike throughout its distinguished history, leaving a legacy that will last for years to come. Capital Hilton, a member of Historic Hotels of America since 2014, dates back to 1943. Parking: Self-parking: Not Available. Valet parking: $62.00. Secured: Available. Covered: Available. In/Out Privileges: Available. Other Parking Information: Out by 5 pm day of c/o. Limited oversize $75/day.